Am I proving how old I really am when I say, “I can remember when I could buy hamburger for $0.99 per pound.” Well I can and in my mind it doesn’t seem all that long ago. Granted my kids were babies then, but that too doesn’t seem so long ago. Nowadays, finding hamburger for $2.39 per pound on special is probably the best I can do. Of course there are those rare occasions when I happen upon a package or two that might be $1.99 per pound, and you can be sure that I snap those up without hesitation. I have even gone so far as to discuss this with the butcher at my local Meijer’s store and after sharing a trip down memory lane and agreeing that $0.99 a pound will probably never be seen again, he did tell me that a few times a year he does put hamburger on sale for $1.99 per pound. I remember this! 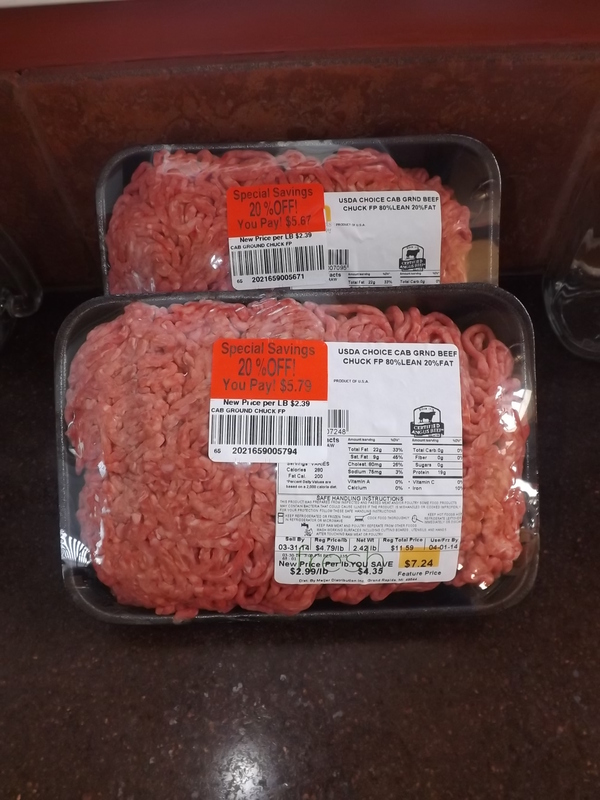 Last year around Memorial Day and then again around the Fourth of July I was able to get hamburger for $1.99 per pound on sale, and for joy, for joy — even found several packages in the clearance section for $1.59 per pound. I just love those red clearance stickers. In fact, my basket typically will only have meat in it if it has those red clearance stickers on it these days. Since I am going to bring the meat home and freeze it anyway, I could care less if it expires the day I buy it. It will be eaten long before freezer burn even takes hold, so no worries. This morning, before dropping my daughter off at college we stopped off to pick up four things from Meijer’s. A half-full shopping cart later, I had three packages of $2.39 per pound hamburger, two packages of $0.79 per pound chicken leg quarters, and three packages of $2.29 per pound brat sausage, along with Duncan Hines cake mixes and brownie mixes 10 for $10 with the 11th item free. Yes I did manage to remember the original four items I specifically went shopping for, but what a great morning for bargains! I can think of no better way (okay this is a bit of an exaggeration, but it is still a pretty great way) to kick off a Monday morning. I am definitely Simply Grateful for this!